For more than 30 years, Dura-Built Fence has been building high-quality fences for residential, commercial, and municipalities in the North Shore area. Owned and operated by Ed White, Dura-Built has built a strong reputation for excellence as a top-rated fencing contractor. Skilled workmanship and exceptional customer service is demonstrated with every installation. Our expert team of professionals have been with Dura-Built for years and will work with you to build your project from the ground up – selecting the right design and materials to meet your needs. So whether it’s basic chain link, wood, vinyl or iron, you can rely on us to provide a quality fence and complete customer satisfaction. Vinyl fence installations are relatively new to the fencing market and have become popular with their affordable price and low maintenance. Vinyl fence will keep its looks for years and will not rot. Vinyl fence not only offers a variety of styles to choose from and some fence styles can come in different colors or wood grain finishes. Examples of vinyl styles include Picket, Privacy, Ornamental, Post and Rail and more! Dura/Built Fence has been building chain link fence in the North Shore area with pride for over thirty years. Practical, chain link is relatively easy to install and cost effective for light residential to heavy commercial fence applications. Whether galvanized, black, green, or brown vinyl coated chain link, Dura/Built offers a variety of styles to choose from and can create a unique design to meet your needs—from deer fences to custom security gates. Durable and attractive, wood fencing is perhaps one of the most appropriate fencing in the Northeast. It typifies the generous foliage of the area and blends well in the environment. Dura/Built Fence uses select grade cedar and pressure treated posts with galvanized hardware for long life. There is a large variety of cedar fence styles along with installing an arbor or trellis to fit your project. Ornamental iron gives a stunning look to your property with the ability to last many years with little or no maintenance. Dura/Built Fence can also offer a special powder coating for added durability. We are proud to say our iron fence material is made in the USA. 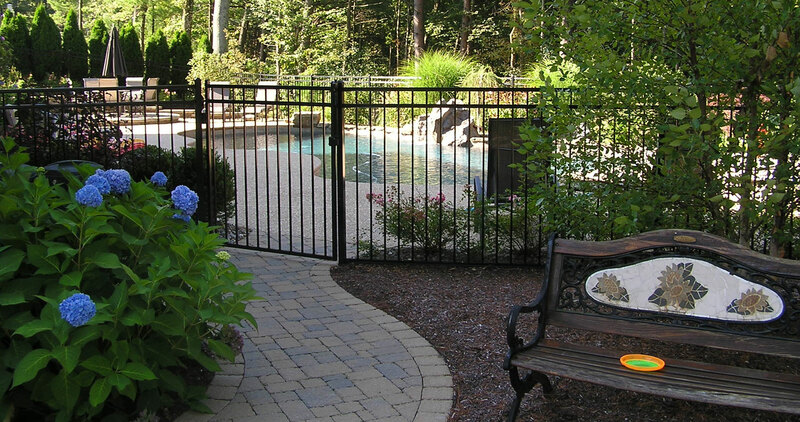 Each fence type, including ornamental iron, offers a variety of styles to choose to meet your needs. So whether you’re putting up a pool enclosure or a driveway gate, you can count on Dura/Built Fence to fabricate fencing and gates to fit almost any residential and commercial applications. © 2015 Dura/Built Fence Co.